Here in Portland, we have a fantastic animal rescue organization call the Pixie Project. This group does so much for animals. In addition to offering important low-cost and free vet services (including spay and neuter programs), they also work to take at-risk animals from overcrowded county shelters, get them on their feet (er, paws), and find forever families for them. This is an organization that saves the lives of so many beautiful, innocent creatures who might otherwise be killed. This year, Alyson and I are participating in The Pixie Project’s annual Furbowl bowling fundraiser, and we would really appreciate your support for these animals! $25 feeds all the pixie animals for a day! Donations are matched! That means that every $1 you donate will be matched by a sponsor to make it $2! 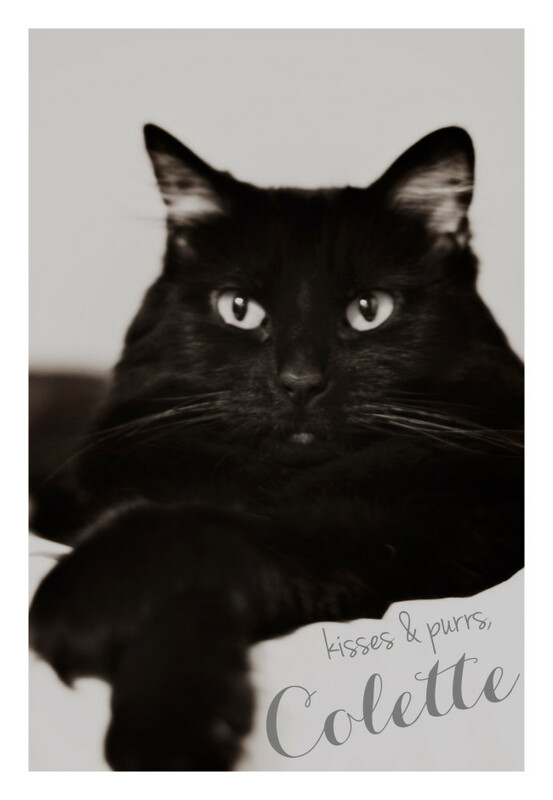 You may or may not know that Colette Patterns is named after my kitty, the ultra-glamorous (but reclusive) Colette. If you donate on my page, Colette and I will send you an autographed glossy photo with a thank you note. Isn’t she beautiful? Can you believe that this movie star kitty was herself born on the mean streets (or possibly in a wood pile)? Click here to donate any amount to help care for these animals (just click the big green “donate” button on the top right). Once you’ve done that, click here and enter your name and shipping address where you’d like Colette’s thank you note to go. Thank you so much for helping these animals find their forever homes and avoid a sad fate! Denver folks! Join me and Alyson at Fancy Tiger on Thursday! Hi, the post-donation link isn’t working; it’s leading me to google and it appears to be accessible by the colette team only. I logged into google just for the hell of it, and I got an error message (“You need permission. This form can only be viewed by users in the owner’s organization.” etc). I’ll check back over the weekend. I hope you raise lots of $ for the animals! Thanks for letting me know, Rita! It should be working now. Luke and I were so lucky to adopt our dog Frankie and cat Lebron from the shelter. When we got Lebron he was sick and required some medicine and Frankie was actually adopted and returned to the shelter, so their chances of being put down were increased. It breaks my heart to think about! When I’ve talked to the people who run The Pixie Project in the past, they explained how many animals are in danger of being euthanized for very minor reasons. For example, an animal that needs a little dental work or has a minor infection is less likely to be adopted, even though they are easily treated. So The Pixie Project takes these animals, gets them the services they need, then places them into the loving homes they deserve. I think anyone with pets can relate to how heartbreaking a thought it is that your own beloved animal could be killed for something that could be cured with antibiotics! They deserve a chance to find a family and make someone happy. I love that you guys are doing this! Both my dogs are adopted (one from a friend who couldn’t take care of him any more and the other from a shelter) and I’d adopt ten more if my landlord allowed! :) I’m so glad you guys share both of my passions- sewing and animals! Thanks for supporting this awesome project! Both of my kitties are best friends as well, one I adopted before he made his way to the shelter, the other was brought to me by his mother, a feral cat, that lived in our neighborhood, she dropped him off on our doorstep one morning, came into our house to feed him twice a day, never allowing anyone to touch her, and after 8 weeks she left our home never to return. Saving animals is a great cause and I am so glad that you feel the way I do. Our three cats are adopted from associations doing some great work with so little means so thanks for what you are doing for them. So many people think of them as mere objects that you can ditch whenever you fill you do not want them anymore (because they are old or sick or just because you move!!!). Those adopted animals give so much in return for a home of their own and they are a real blessing. I am so happy my little girl gets to grow up with them! I love the old picture of Basil and Colette! I hardly remember when they were that small. They grew up well. What a great idea. 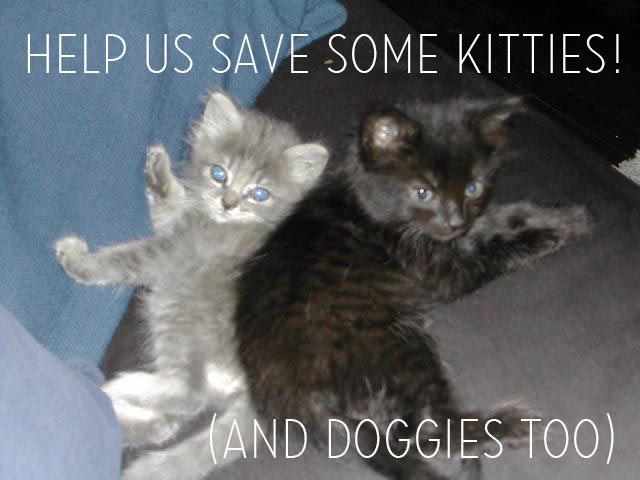 I just sent my (tiny) state tax refund to a local agency for homeless animals. It was a check-off box on my tax return! I always love your kitty posts. For quite a few years I was involved with feral cat neutering and spaying (and socialized 7 feral kittens in the process). Austin has a lot of great animal organizations like Portland. The volunteers and doctors work so so hard. I hope yours is a successful funding!